The Nanojet system is the right choice for applications where volumes from 8 nl and larger are needed to be dispensed. The Nanojet technology forms a liquid jet by means of a time/pressure-controlled dispenser system. 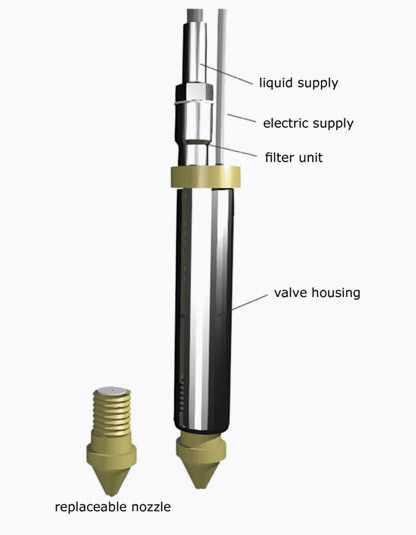 Liquid from a pressurized reservoir is pressed into the dispenser head which consists of a micro valve and a nozzle. By opening the valve, liquid flows through the nozzle and forms a well-defined jet. The integrated micro valve switches the jet on and off. Since the micro valve switches at a very fast rate, volumes down to 200 nl can be dispensed. The special nozzle geometry forms a laminar jet, which is stable over a wide range before breaking off into droplets. By offering different head types with piezo or solenoid valves the Nanojet Technology covers a wide range of applications. 50 nl will be dispensed contact-less in a laminar jet. 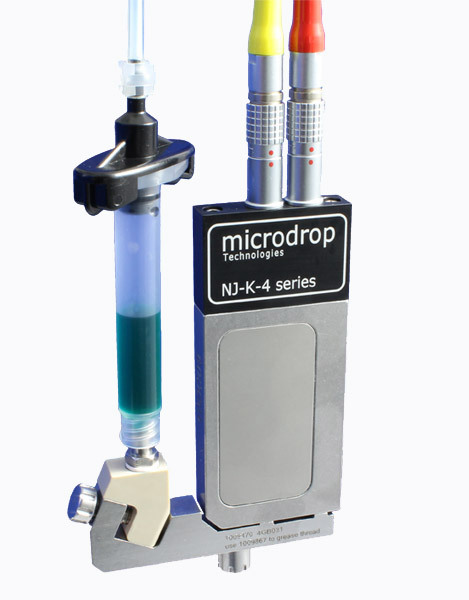 Liquids with a viscosity up to 8.000 mPas with single volume starting from 8nl can be dispensed contact-less or contacting.